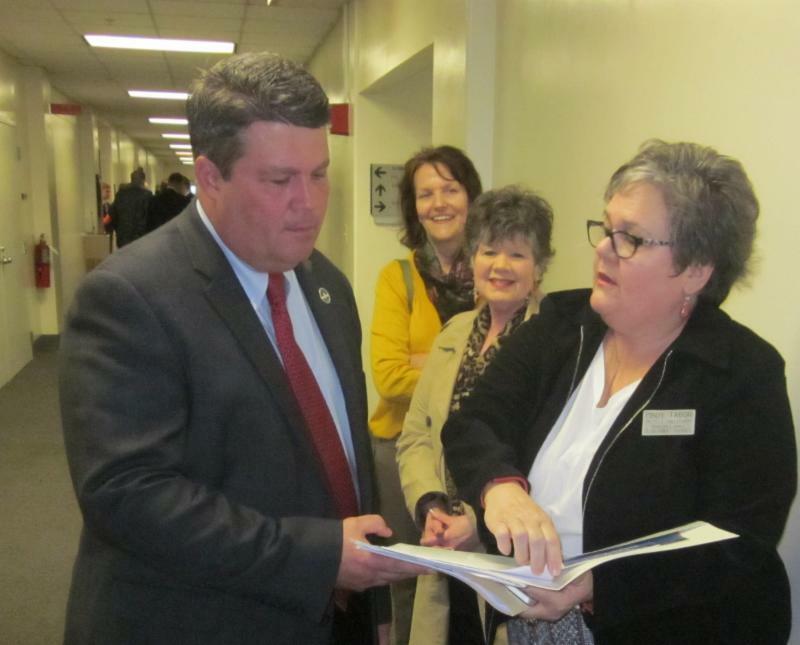 The KY State Long-Term Care Ombudsman Program joined the Kentucky Association of Gerontology and the Alzheimer’s Association for Senior Services Advocacy Day in Frankfort, Kentucky on February 23. Consumers and advocates had an opportunity to listen to a panel of legislators and ask questions. Rep Addia Wuchner, Rep Joni L. Jenkins, Sen Julie Raque Adams and Sen Ralph Alvarado served on the panel. Among those asking the panel members questions was State Ombudsman Sherry Culp. Culp asked, “Sexual assault of nursing home residents with Alzheimer’s/memory disorders are reportedly on the rise. Research indicates this is in part due to short/insufficient staffing in nursing homes. What can you as a legislator do to help protect residents from isolation and abuse?” In response a panel member mentioned abuse registries and agreed to further look into issues impacting consumers of long-term care. Culp had recently been interviewed about sexual abuse of nursing home residents in a CNN investigative report Sick, dying and raped in America’s nursing homes. Kentucky has 15 District Long-Term Care Ombudsmen. Many were in attendance and had made appointments to meet with their legislators about protecting the rights of nursing home residents through legislation. One of the bills that ombudsmen didn’t think would improve care was Senate Bill 4 (SB4). This bill would institute Medical Review Panels creating a barrier for vulnerable, elderly, and poor residents to directly accessing the court system to hold providers accountable. Since this bill would do nothing to improve care, ombudsmen promoted instituting a staffing ratio of 4.1 hours per resident day. This minimal staffing level has been supported by many national and international studies including those from the Centers for Medicare & Medicaid Services. The daily work of Ombudsmen is in nursing homes, personal care homes and family care homes advocating for residents’ rights one resident at a time. However, on Senior Services Advocacy Day, Ombudsmen were able to come together to inform legislators about the Long-Term Care Ombudsmen Program and engage in vital systems advocacy. 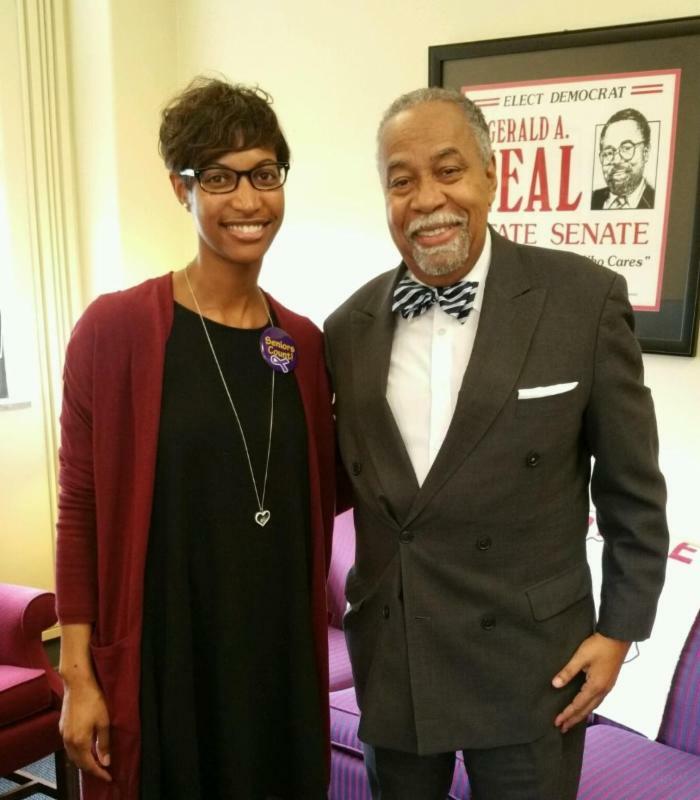 Natalie Brown-Radtke, District Ombudsman in the Louisville area met with State Senator Gerald Neal about Senate Bill 4 and her concerns regarding insufficient staffing in nursing homes and it’s negative effect on care residents receive. Contact Your KY Legislators Today! Let them know you DON’T support Senate Bill 4 Medical Review Panels. The real solution to the high cost of poor care is staffing standards. 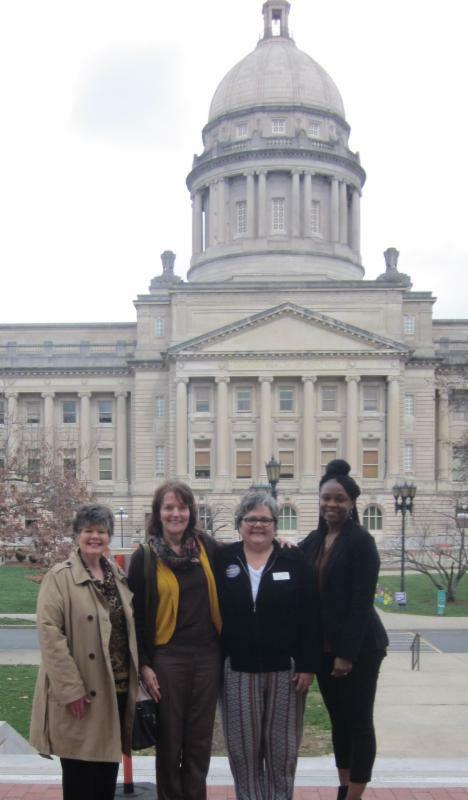 District Long-Term Care Ombudsmen Sheila Howard of Owensboro, Celia Gutfreund of Mayfield, Cindy Tabor, and program Ombudsman Belinda Babb of Hopkinsville were proud to serve as the voice of residents who could not travel to Frankfort to meet with legislators. In Kentucky, there are 270,000 caregivers of persons with Alzheimer’s or another dementia providing more than 307 million hours of unpaid care valued at over $3.7 billion. The most recent census shows that 829,193 individuals aged 60+ comprised 18.8% of the total population of Kentucky and that percentage is expected to grow to 25.6% by 2030! Total funding for the Department for Aging and Independent Living for the years 2009-2014 has decreased by a total of 26% as the population is increasing and needs for services escalate. Loss of senior services would affect workplace productivity and cause work loss for caregivers financially impacting Kentucky businesses. Listed below are bills and issues that impact older adults. For more information about a particular bill, click on the bill name. SB4 – Establish KRS Chapter 216C; create within that chapter various new sections establishing a medical review panel system for use in civil litigation relating to health care providers, including sections setting out definitions, delineating covered health care facilities and providers, panel membership and formation, functions and deliberations of the panel, and utilization of panel results in civil actions; allow for the electronic filing of proposed complaints if the Cabinet for Health and Family Services establishes an electronic filing system. SB4 imposes unnecessary costs and barriers to justice for long-term care recipients who have few financial resources. This bill does nothing to improve conditions or staffing rations in long-term care facilities. SB129 – This legislation proposes providing information and training to family caregivers before a loved one goes home from the hospital or other medical facility. SB29 – Amend KRS 605.120 to permanently establish a kinship care program. The Cabinet shall establish a reimbursement system, within existing appropriation amounts, for foster parents that comes as close as possible to meeting the actual cost of caring for foster children. Funds will provide for the board, lodging and care of children. The cabinet shall establish, implement and maintain a program for kinship care that provides a more permanent placement for a qualified relative for a child that would otherwise be placed in foster care due to abuse, neglect, or death of both parents. HB83 – This act grants civil and administrative immunity to broker-dealers or investment advisers who, with reasonable belief and in good faith, report suspected financial exploitation of eligible adults to the Cabinet for Health and Family Services and the commissioner of the Department of Financial Institutions. Build on KAG’s advocacy efforts to strengthen interaction with state and federal legislators. Provide opportunities for seniors to be heard by legislators. Develop a collective picture of senior citizen needs and concerns at the regional, state and national levels. Enhance partnering with agencies, service providers and KAG on older adult issues and advocacy. Involve media to more effectively tell the story of older adult issues. We are always looking for members who would like to serve on the Public Policy Committee. If this sounds like your cup of tea, let us know at trawlins@aarp.org. HB 180, the fictive kin bill passed the full House and the next step is committee assignment in the Senate. It is likely to go to the Senate Health and Welfare committee, though not a guarantee. SB 29, the kinship care program bill, is in the Senate Health and Welfare committee waiting to be heard. I encourage you to reach out to your Senator if he or she is on the committee to ask that it be placed on the agenda and heard as soon as possible. The committee members can be found HERE. It needs to be heard in order to be voted on and pass the committee so it can move on to the full Senate. Encourage the kinship caregivers you know to call or write their legislators and share their stories. Form letter can be found HERE.